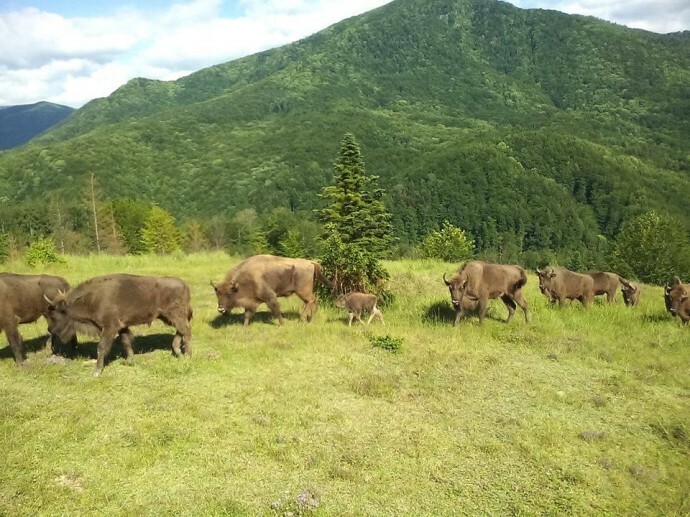 The newborn bison is already exploring the beautiful nature of the Southern Carpathians rewilding area. We believe it means good luck for the bison reintroduction scheme in the whole region, because he is Born to be Wild! Very soon – most probably in September – the herd will be released completely into the wild. In May, 17 European bison were transported to the Southern Carpathians from wildlife parks and breeding stations in five countries across Europe, in one of the largest-ever bison reintroduction in our continent, organised by Rewilding Europe and its partner WWF-Romania, strongly supported by the Municipality of Armenís and several Romanian institutions. The second transportation of bison to this area is now being planned for the end of July this year. These bison will also be kept for a while in an acclimatization enclosure to get better adapted to their new home. Once they are released into the wild, the bison will not be fed or handled any more, but instead treated completely as the normal wild animals they are, so that they become a full part of their ecosystem and the natural processes there. The aim is to build up a new, long-term viable, free-roaming population of European bison in the Tarcu Mountains. Bringing in hundreds of animals over a 10-year period, and with the intermediate goal to reach around 500 animals by 2024. The latest member of the Plopu bison herd, but also the whole herd has already become a tourist attraction, just as we predicted. “Rewilding Bison in the Tarcu Mountains Reserve” is the Grand prize of the July draw of the Rewilding Europe Travel Club. Best of luck, everyone!